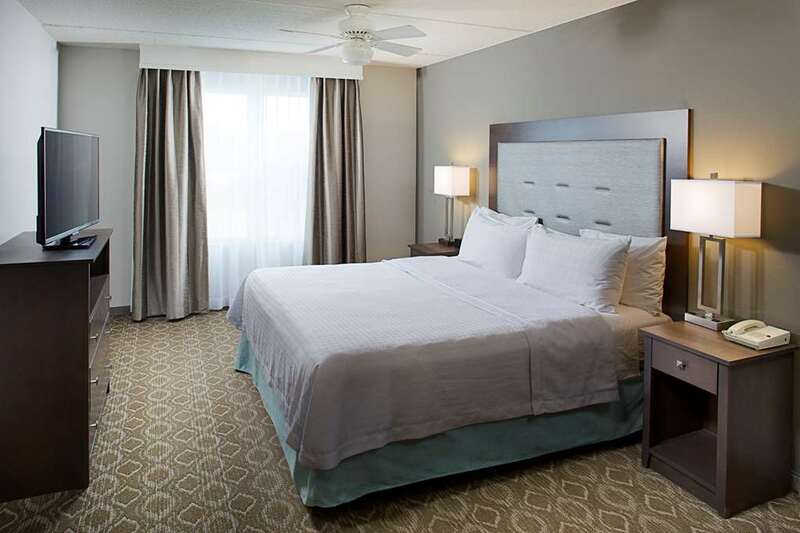 The Homewood Suites by Hilton Cleveland-Solonhotel is located in the heart of the business district of Solon an attractive and secure suburb of Cleveland Ohio. The Homewood Suites by Hilton hotel is within walking distance to theaters and restaurants and minutes from the Beachwood Mall the Aurora Outlet Mall Chagrin Falls and Geauga Lake Park. Downtown Cleveland Ohio is just 15 miles and includes Jacobs Field Browns Stadium the Rock - Roll Hall of Fame the Children*s Science Center and much more. The Homewood Suites by Hilton Cleveland-Solon hotel in Solon Ohio has 86 studio one bedroom and two bedroom suites available in smoking or non smoking. All guest suites include a kitchen with home like appliances and cooking utensils a living area with pull out sofa and TV with DVD player. Guests at the Homewood Suites by Hilton hotel in Solon Ohio can enjoy the daily complimentary Suite Start hot breakfast and the Welcome Home reception featuring a complimentary light meal and beverages Monday through Thursday evenings /subject to state and local laws/. Amenities at this Cleveland Ohio area hotel include an indoor pool whirlpool outside sports court patio with gas grill an executive business center a fitness center and complimentary high-speed internet connection. If transportation is needed to a business within a five miles radius Monday through Friday the Homewood Suites by Hilton Cleveland-Solon hotel can arrange complimentary service for you. /Advance notice required./ Cash will be only accepted upon departure and not at check in. Another form of payment must be given at check-in.